We have two independent rooms available for performances. Main entrance via Parsons Pool. Seats around 100 people on ground and balcony levels in a combination of fixed pews and movable chairs. The ‘performance’ area at the front consists of a relatively small platform in front of a conventional pulpit. The available area can be increased by moving any/all of the front two rows of chairs. Main entrance via Bell Street. Adjoins main hall via two sets of back to back doors either side of pulpit area. The doors are quite good at isolating moderate noise in one space from the other, but would not be perfect for isolating performance music, singing or similar. The room is multi-use and regularly re-configured with different layouts chairs and/or tables. There is a well provisioned kitchen linked via two serving hatches. There will be a Youth club in the room above the Shearer room between 5 and 6:30pm on the Saturday. This may result in some noise being heard in the Shearer room itself. i.e. from children running around. We have fixed AV/PA systems available in the church hall, but they are aged and awkward to operate. You are advised not to rely on them. They are available, but we cannot offer support personnel during performances. There are no AV/PA facilities in the Shearer room. There are separate hearing loops in the church hall and Shearer room. Whilst we very much want to engage with the wider community, bearing in mind that the building is primarily associated with a Christian church, we have certain restrictions on the type of material allowed in a performance. We therefore request that you give us an idea of what you intend to deliver when requesting a booking. Material that includes swearing or certain adult themes will not be acceptable. Feel free to contact us if you would like to clarify/discuss the question of content further. Click here for latest rooms and times. 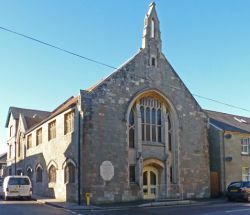 The building is used for weekly Sunday services (x2) and by various groups throughout the year. Some of these activities will still be taking place during the fringe. We have indicated availability on an online calendar and will strive to keep this up to date as and when bookings/circumstances change. If you would like to request a booking, then please use the linked calendar to identify a potential time/room and submit your request to steward@shafteburyuc.org.uk, along with a description of the content of your performance. There is dedicated off road parking for two cars on our premises at the rear of the building, but please note that a second vehicle will box in the first and this space is probably best used as a short term drop off/pick up point. There is a variety of free, short stay on street parking nearby, but this is nearly always occupied. There are several paid for car parks in town. The closest is Bell Street car park, less than 100 metres from our building.